Check back here for upcoming dates or contact me for more information. 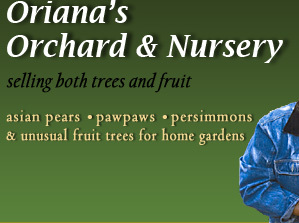 Oriana's Orchard & Nursery sells fruit trees and fruit. What began as a hobby, has become my business. I specialize in growing Asian pears trees for sale. I also grow other lesser known fruits that are worthy of attention. 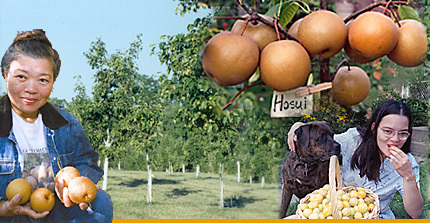 Every fruit tree and plant I sell would make a wonderful addition to your home orchard. I have test grown over 60 varieties of fruit trees and plants, and have selected the best varieties for Northern Illinois. The fruit must have superior taste, the trees must be easy to grow, with minimum disease problems. They also must be hardy enough to withstand Chicago's harsh winters. All our trees are grown at our western Illinois orchard, near Wisconsin, where winters reach -30 degrees. Fruit trees are available from March 15 through June. Most are in 5 gallon containers, and are 2 or 3 years old plants. All plants must be picked up in person at my Skokie home just north of Chicago. They can also be purchased at my booth at one of the Farmer's Markets or local events I attend. I	also	provide	on site home orchard consultation, tree espalier	and custom grafting. Contact me for more information.